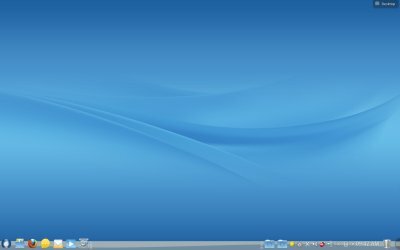 ROSA is a Mandriva-based distribution forged in Russia, offering five years of support in the manner of Ubuntu. I think this is officially only the second such release for desktops, excluding the CentOS family. Definitely interesting. All right then, let's see what ROSA can offer us. Now, please note that ROSA comes in two flavors, FREE, which includes free software only, and Extended Edition, with non-free software and proprietary components, like multimedia codecs. This is similar to the Mandriva model, in that you have tiered products offered. And much like with Mandriva, navigating the official site is a bit tricky. But we managed all right. I settled on testing the FREE version, which may or may not turn out to be a fatal mistake. Well, let's learn how the testing went. In Soviet Russia, the live CD boots YOU! You will forgive an occasional meme. Anyhow, the system booted well from a live USB, but it took quite a while before the desktop showed. The handsome 1.5GB distribution took some time loading the KDE environment. ROSA is a fairly elegant distribution, with a simple, clean layout, a handful of posh icons, windows-like decorations, and a classy menu. 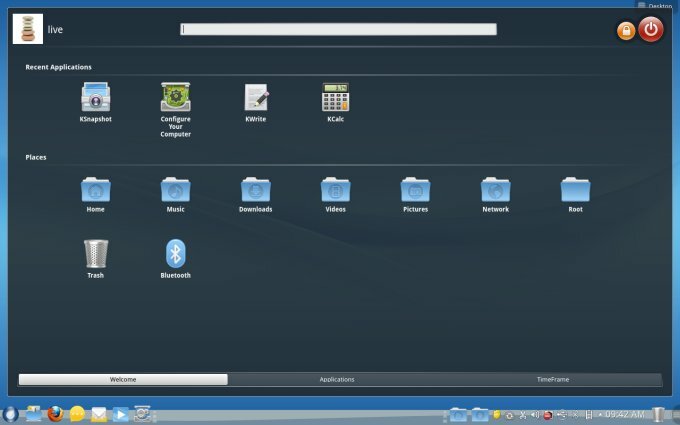 All in all, you would be tempted to guess what desktop environment you're working in, as the customized KDE leans toward more Gnome-like features. 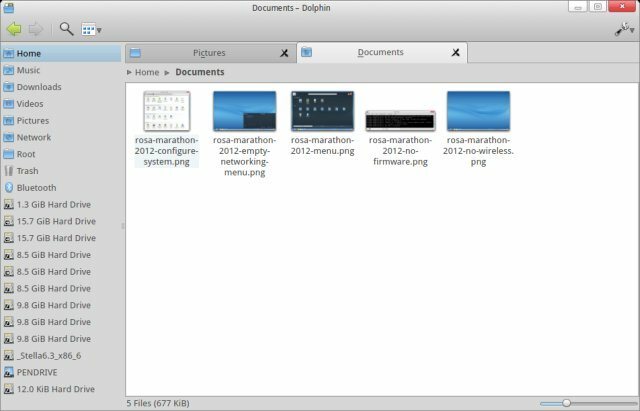 Dolphin is also quite cute, although you do not get a shortcut for Documents in the sidebar for some reason. Notice the windows-like buttons in the top right corner. Still, the looks are quite sleek and the fonts cool. 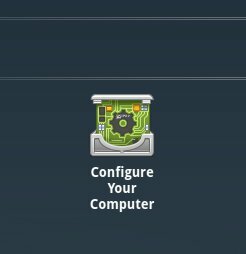 The system configuration menu comes in two flavors - one very much Mandriva-like, the other stock KDE Systems Settings. 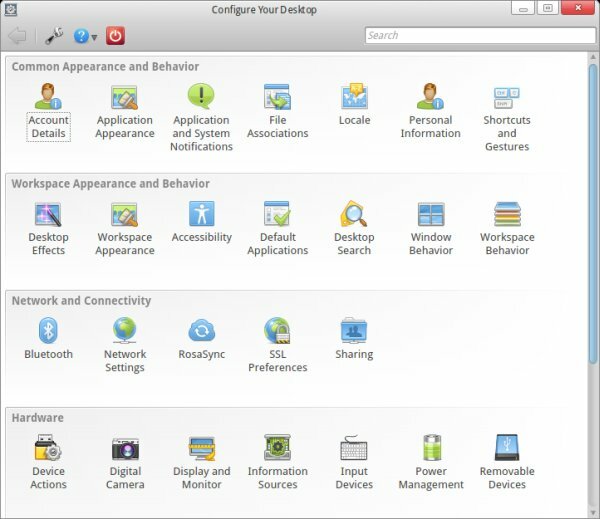 The shortcut in the bottom panel fired the latter, the one that shows in the system menu with an almost identical icon launched the Mandriva version of the control center, so I was a little confused there. And I do not know why both are really needed. But the big one was that my network was nyet. 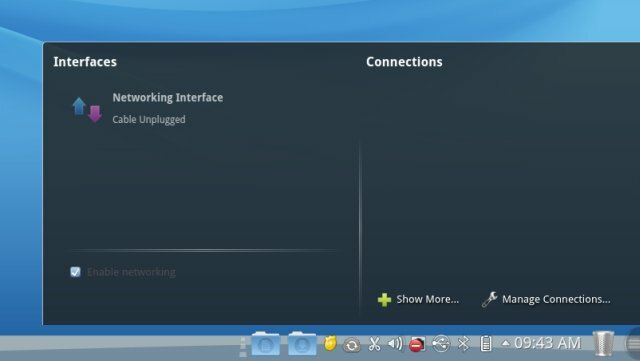 Looking at the network manager, it only offered wired connectivity, no Wireless. Strange. Burrowing into dmesg, I soon learned that the distro did not have firmware for the Wireless device. A simple, stock Intel card, not much different from the generic wired one. So why bother with either, or why not both? Or perhaps this is what the FREE version is all about? Does this mean I have toiled in vain, trying to bring happiness to my readers and myself, only to be foiled by ideology? As you can imagine, this is where the testing ended. Maybe it was my own mistake. Maybe I did not read well enough before trialling ROSA. The truth is, it makes no difference. You do not need and should not need to spend time learning about operating system before using them. The whole idea is to get a seamless, transparent behavior and a pleasant experience, and if this means having to figure out what is free and what is not, and somehow know that your Wireless card firmware might be considered non-free by some vague standard, then thank you, but no thank you. If you're looking for five years of support, you're better off with Ubuntu. Shame really, because I was rather looking forward to testing ROSA. Finally, something new, something fresh. A system that does not come from the English-speaking world, which means a different mentality, five years, Mandriva baseline, they all sound like a damn good recipe for awesome fun. Alas, no. Not since Trisquel was I this disappointed. Another potential gem, killed by politics. Lastly, I cannot tell you how good or bad this distribution really is, because I didn't get to test it properly. My hunch tells it's a fairly decent one, but we shall never know now. Well, I might test the non-free version one day, but my goodwill for today is spent. Take care.